We got to the parking lot and realized that Dad had lost one of his tennis balls. Now, Dad is not playing Tennis, but he is walking with a walker while he recuperates from his fall, broken hip and surgery. I had folded up the walker and put it behind a bench so that it would not be a tripping hazard and it must have fallen off under the bench. I went back into the restaurant. I got a quizzical look. "Im retrieving a tennis ball," I said rather flatly, as if it was a common occurrence. I got no objection and the receptionist went back to looking at her list. I went to the bench and could see the ball. It was behind a wrought iron bench. I reached over, but my arm was not long enough to reach it. I stopped and regrouped. I got down on my hands and knees to see if I could come from the front, but I was blocked by various obstacles. Then some people leaving had halted as they waited for me to get out of the aisle. "I'm trying to retrieve a tennis ball," i said sheepishly. They did not want to wait for the longer objection. I'm sure when they got into the car there was a lot of eye rolling and wondering why a grown man was brining a tennis ball into the restaurant. I decided the only way to get the ball was move the bench. I pulled on the right end and heard a crunching noise as a big pot nestled under the end fell to the floor. It rolled away into the aisle. I got the ball, replaced the pot (which did not appear to be hurt) and headed to the door. I replaced the ball on the foot of the walker and started to wonder. 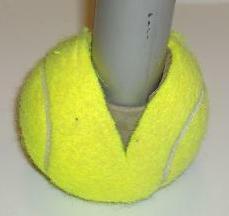 Are there more tennis balls being used today on the bottoms of walkers or on Tennis courts? When does the ratio have to be so high that we call them walker balls instead of tennis balls? It made me think about lots of the words of Jesus. its one thing to no the words, its an entirely different thing to do the words. I can call it a Tennis Ball all day long, but when it is slit open and put on the bottom of a walker it really is something else. Its not enough to have the words, we have to do them.